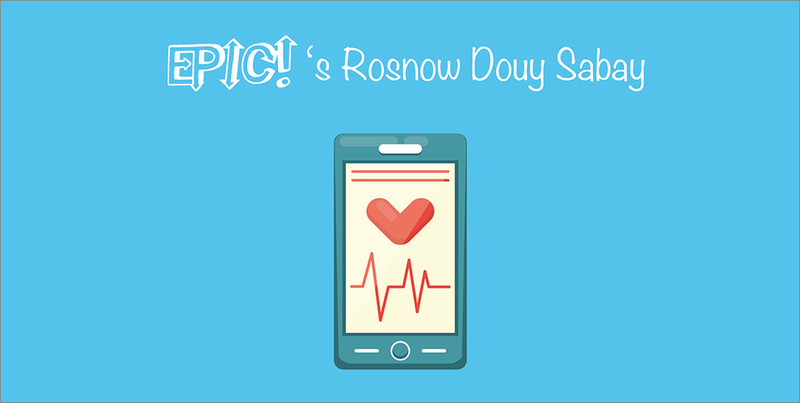 Rosnow Douy Sabay (RDS) means happy lifestyle – that’s the ultimate goal that this particular team from EPIC hopes to help people in Cambodia achieve with its product. By creating an online platform containing information about women’s health and living a healthy lifestyle, the team hopes that women and families will be engaged, inspired and educated about how they can take care of themselves. At this point, the team, who are also part of the Agile Development Group, are currently taking part in Impact Hub’s EPIC programme, the Kingdom’s first year-long incubator. To find out more about their project, Geeks in Cambodia (GIC) sat down with Dalen and Sreypov from team RDS to have a chat. What inspired you to develop RDS? RDS: We realised that many young women in Cambodia had concerns about their health but they felt shy to ask and did not have the proper information needed to make informed decisions about their health. Furthermore, we realised that although there are many websites available with trustworthy information, they are all in English and that can pose some difficulties in terms of how many in Cambodia can understand it. By developing RDS, what we hope to do is to ensure that young women in Cambodia get the appropriate healthcare advice without needing to spend money on treatments or consultations that may not help. Through this, we hope to help them overcome the cultural barrier of being too shy to ask about their health. One area that was mentioned to us was that the RDS platform will afford the women privacy when using it, how does it do that? RDS: Well for that, it’s simply because the platform is accessible from the hand phone, so women will be able to check out the information in their bedrooms, in class and in private without needing to let anyone know. What’s more, if they find the information useful, they could use the platform to share the information with a friend. If needed, they could locate a trustworthy clinic nearby as well. How did you collate the database of information for the platform? RDS: We set out to target customers aged 16-35. We ran some tests with them and asked them what type of information they needed. Then, we went out to our trusted partners and NGOs who have written content about such health topics and used that to build up our database. Moving forward, what we hope to do is to gamify the content. For example, we can install a quiz after each article and users can chalk up points from getting the answers correct. Eventually, when enough points are stored, they’ll be able to redeem a prize. That’s our way of using the aspirational behavior of our target demographic to bring them in to use our platform. Why did you join the EPIC programme? Dalen: For me, it’s really because we want to change, try new things and see how we can develop new technology to benefit the young women. I guess it’s really all about getting to know the mentors, to get knowledge from them and from there, further develop our ideas. Sreypov: From my perspective, because I’m a young women myself, it was really about how we can best equip ourselves to inform the young women about their health. From there, we hope that our website will assist them in making the best decisions possible. In joining the EPIC programme, what did you hope to get out of it? Dalen: We came in really wanting to learn how to build a business. And where we are now, we know that if we are successful, it will really help the young women in Cambodia. To do that, we know we’ll have to reach out to those in the rural areas as well. As such, I think learning about the business model canvas and the need to understand our customers has been really essential in helping us to think about how we can scale our project in the future. Moving forward, how do you hope your project will develop? RDS: Well, we hope that our project will become the no.1 health platform that young Cambodian women can turn to when they need health advice – that they will know that our system is one where they can get reliable and validated information. What advice would you give to aspiring entrepreneurs like yourselves? RDS: Our advice would be – don’t compare yourself to another team. Just be confident in the product that you have, feel in control and trust yourself because the more you share your ideas, the more you’ll be able to learn about them. This is especially true if you’re coming to EPIC because you would join this kind of programme to learn. In other words, you might have your own concepts and preferences but we would encourage you to keep an open mind and listen to the mentors that speak to you. Isn’t it amazing to see how teams are using technology to meet real social needs? We at GIC wish the RDS team all the best as they continue to iterate and develop their platform! Stay locked to our website tomorrow as we bring you yet another EPIC team, Mekong Farms, who are developing a model farm for Cambodian farmers to follow.